If it feels like you need a translator to talk with your teenager, you're not alone. Between all the shooks, lits, fires and fams, parents often get lost. Here's a guide to understanding teen slang. If it feels like you need a translator to talk with your teenager, you’re not alone. Between all the shooks, lits, fires and fams, many of us parents are lost, too. But that trend may be waning. Teens can now use disappearing Snapchat messages and “Finsta” (fake Instagram) accounts without parents stumbling upon them. 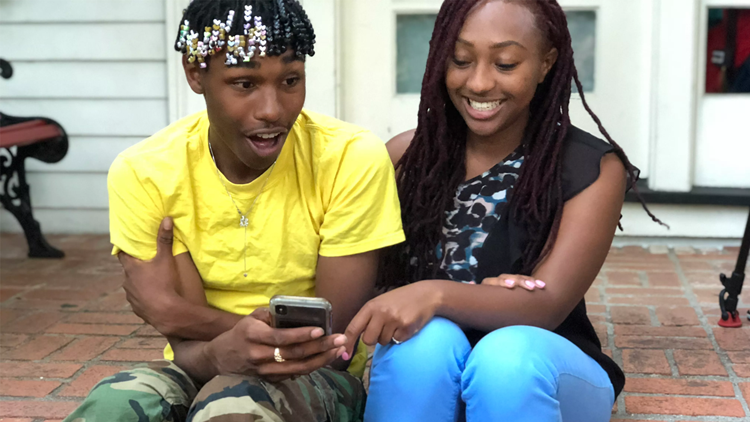 “Parents used to go through their kids’ text messages, so they would use slang, emoji or abbreviations more,” 17-year old Lauren Trujillo of Oakland says. Trujillo and several other teens also say they’re communicating more with gifs and memes now more than ever before. So why do they do it? For the most part, teens use slang as a way to create their own identity, fit into specific social groups and express independence. “I just talk with a lot of my friends in this weird language my parents don’t understand, not because I don’t want them to understand it, but because we just think it’s kind of weird and funny and ironic,” Trujillo says. “Wait, I used 'addy' for address,” 15-year-old high school sophomore Dylan DeMarco says. Sigh. Each of these words or phrases has its own unique origin story, but any discussion of teen slang also needs to consider cultural appropriation. Much of modern teen slang – and slang in general – originates in the African-American community. Black musicians, particularly many hip-hop artists, have contributed greatly to the evolution of language over time. The LGBTQ movement has also spawned some of the popular phrases as well. There’s an ongoing debate over whether it’s OK for teens and adults who aren’t part of these communities to adopt their slang – terms such as finna, fleeky, thicc – and use it as their own. “As far as appropriation goes, there's a sense that groups who have privilege will pick up terms from groups with less privilege, possibly to express a sense of counterculture or coolness,” Kansas State's Kohn writes via email. “Because language is intimately linked to culture and history, such terms often become cool precisely because they arose as a form of resilience in the face of hardship." When people adopt these terms without recognizing their history or cultural context, she says, they effectively get the benefit – the cool factor – without having to experience the struggle, such as historic racism, that gives rise to the term. Musician Katy Perry found out just how heated the debate over slang appropriation can be when she said “wig” on an episode of "American Idol" this past March. People use the term “wig” when something so crazy or good happens that your wig (or weave) flies off your head. The phrase comes from African-American Vernacular English (AAVE) and has become associated with the gay community as well. Reaction from both communities and opinion over whether Perry should be taking ownership of the phrase was split. Some saw it as a nod of support from the singer, while others felt she was stealing the term and using it as her own. Slang is always evolving, and in a year or two, the huge list of insider terms you see above will be replaced by a whole new crop of weird words, memes and gifs that don’t mean what you think. It’s OK. We were strange teens once too, and it’s all totally groovy now, right? Here’s a cheat sheet of the latest teen slang and acronyms. Bruh = another way of saying "bro" or "brother"